Emerald Vale opened for golf on Thursday, March 15. We are on spring rates: $15 for 9 holes and $25 for 18 holes (both rates include carts). These rates will continue through May 24. Come see us and enjoy spring golfing! Call (231) 824-3631 or (800) 890-3407 for tee times. Tuesdays and Thursdays are special days at Emerald Vale. Golf 18 holes (includes a cart ) for $29! Call for tee times. Emerald Vale has become a member of the Northern Michigan Golf Network!! If you are a part of our Membership (Stockholder or Associate), you can play at any of the 16 Northern Michigan courses for greatly reduced fees. This should greatly enhance your membership and expand your summer golfing choices. 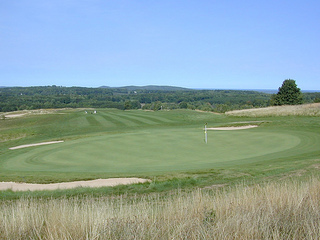 To access information about the courses, click on: www.chestnutvalleygolf.com/network/index.html. If you have a membership with Emerald Vale, make sure that you have received your membership card as you will need it at our reciprocal courses. Many of our outings are open to the public and raise money for local causes. Please contact Emerald Vale or watch for more information on this website if you are interested in joining us or would like to schedule an outing. A great way to have fun playing golf and help others at the same time! The outings usually start early in the morning and the course is generally open for tee times by 11:30.